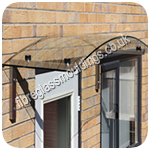 Welcome to the AFM website, UK manufacturers of effective, durable entrance canopies, bay canopies & tops, patio canopies, porch canopies, GRP fibreglass roofs, pilasters & door surrounds , Glass Canopies, GRP dormer roofs & GRP fibreglass sheets. Our door canopies and GRP shelter products are built to withstand the most extreme weather conditions and require no maintenance after installation. 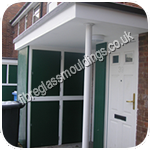 Our extensive range of fibreglass door canopies & shelters are available in a variety of sizes and colours to meet your requirements. 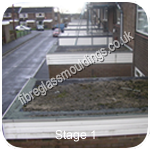 With over twenty five years experience in the business of providing quality GRP canopies, we have found that only a GRP door canopy can endure the environmental change we are experiencing and will only require a simple wipe to revive its finish after installation. 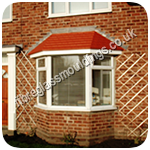 Choosing the correct door canopy from our extensive range is simple as each of our products is of the same high standard. 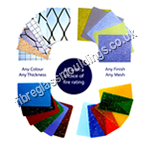 In fact the only difference between each of the products is the style and size. 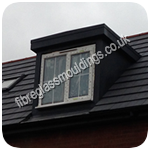 Whether you're looking through, or our choice of GRP canopy or door surrounds, you can trust Architectural Fibreglass Moulding UK Ltd to produce a quality product that fits your bespoke needs. 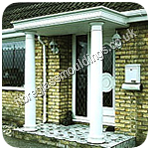 We have a huge range of over-door and front door fibreglass GRP canopies, including choices of Roman, Strand door, and Combination styles. 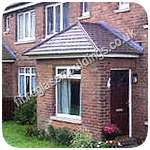 Our fibreglass canopies come in a huge choice of sizes so you can match the product to your specific property. 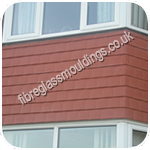 We also carry a huge choice of bay tops and base styles in our GRP catalogue so that you can have a consistent look across your house. 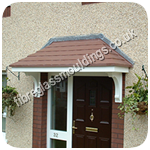 Choosing a combination of door canopies and GRP window products such as a GRP canopy not only makes your property look good, but it will also provide a level of product durability and safety that others cannot achieve. The proven performance level of all of our GRP canopy products means that investing in even the smallest of items such as a product from our fibreglass canopy range will protect your door and look superb for the long term.